Breakfast for Learning has partnered with Treehouse, to mark the 10th anniversary of the beloved heroine, Dora the Explorer. Including an exciting auction of celebrity designed backpacks, the partnership brings together Dora’s quest for knowledge, with Breakfast for Learning’s mission to ensure children attend school well-nourished and ready to learn. 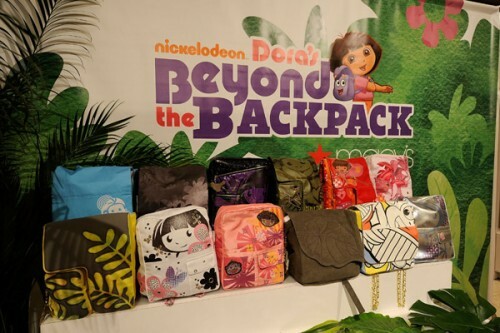 The auction, which began on August 11th, is part of a pro-social campaign entitled “Nickelodeon’s Beyond the Backpack” which champions overall school readiness for preschoolers as they prepare for the important adventure of starting school. Featuring backpacks designed by Salma Hayek Pinault, Shakira, Eva Longoria Parker, Faith Hill, and Heidi Klum, 100% of the proceeds from the auction will benefit Breakfast for Learning’s student nutrition programs across the country. Breakfast for Learning is a national non-profit organization dedicated to raising awareness and support for student nutrition programs to enhance learning and the healthy development of children and youth in Canada. Offering nutrition grants, program support and educational resources, Breakfast for Learning focuses on community centred programming, delivering breakfast, lunch and snack programs in inclusive and nurturing environments. Dancing across this bright, shiny patent bag, Dora and Boots invite you in to a world of play and friendship. Lush embroidery gives these rainforest leaves a subtlety and richness. But look deeper: just behind those leaves is a Dora charm sparkling with Swarovski stones! Pure glamour! In this dazzling world, the flowers are bejeweled with Swarovski dew, and butterflies fly on crystal wings. Explore the carnival! Pinwheels of color and Swarovski crystals provide the dazzle, and Dora and Boots bring la fiesta! Dora shimmers on soft metallic leather while exploring a field of embroidered butterflies. Shakira & Her Boys Cheer Her Husband On! My daughter would love one of these backpacks. She is a huge Dora fan! The charm on Eva Longoria’s bag is pretty cute. Well.. How do i bid? My daughter would absolutely love Shakira Dora backpack. Everytime t comes on the TV she asks for it, how do we get one? Faith Hill , I WANT THAT BAG . ASAP !